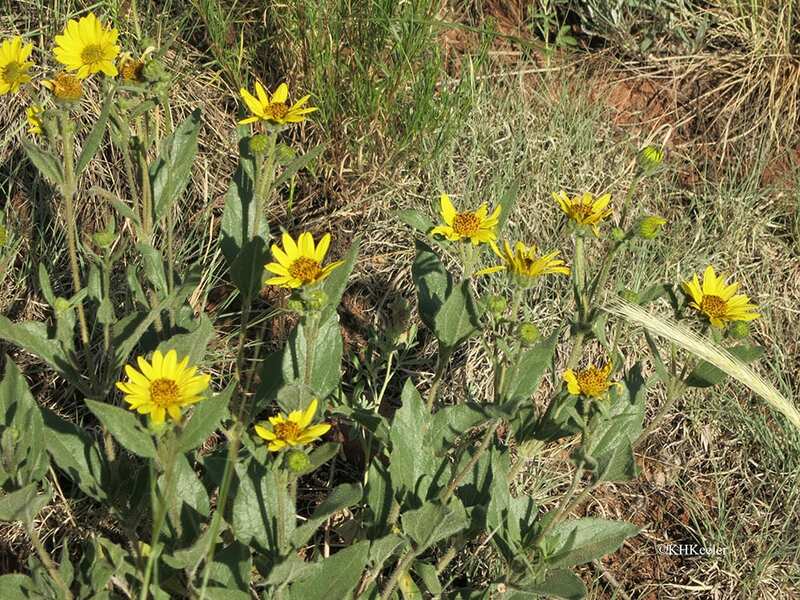 bush sunflower- Helianthus pumila. Asteraceae, sunflower family, The bush or little sunflower is an uncommon sunflower, found only in Colorado, Wyoming and Idaho. The short stature (to 2’ (2/3 m) in a very good year, and habit of forming a clump make it distinctive. The tiny seeds are eaten by a variety of birds and mammals. Native. field bindweed – Convolvulus arvensis. Convolvulaceae, morning glory family. This perennial spreads quickly many feet with its long viny stems. The flowers only last a morning, closing in the heat of the day and never opening again. It is mildly toxic, so horses on a pasture where all they can eat is bindweed will show symptoms of poisoning. From Eurasia. geyer’s larkspur, Delphinium geyeri. Ranunculaceae, buttercup family. The scientific name Delphinium means “shaped like a dolphin” and refers to the unopened buds. 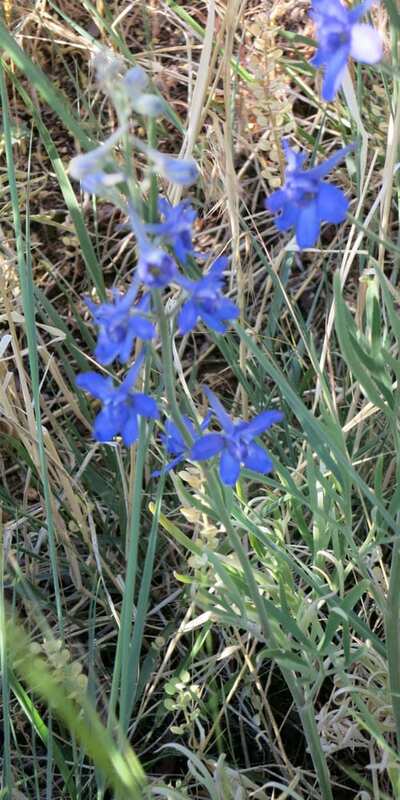 Larkspur is because the flower with its long “spur” on the back of the flower looked like a bird’s foot. Native. goatsbeard – Tragopogon dubius. Asteraceae, sunflower family. Also called salsify. The root is edible, which is probably why it was brought over from Europe. Its expansion westward is one of the best-documented stories of a plant invading North America. Today it is found from the Atlantic to the Pacific. From Eurasia. 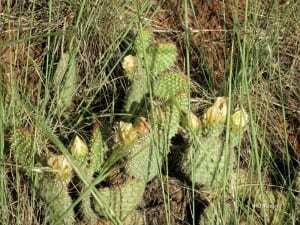 plains prickly pear – Opuntia polyacantha. Cactaceae, cactus family. Cacti are endemic to the Americas, meaning they are native only here. The majority of cactus species are found in the southwestern US, Mexico and Central America, but a few species, mainly prickly pears (Opuntia) grow quite far north. Plains prickly pear may have orangy or pinkish flowers. There are three species very similar species in this part of Colorado, one with pink, pinkish or orangy flowers (Opuntia phaeacantha, tulip prickly pear, also called New Mexico prickly pear). A little bit larger and often with denser spines with brown tips. 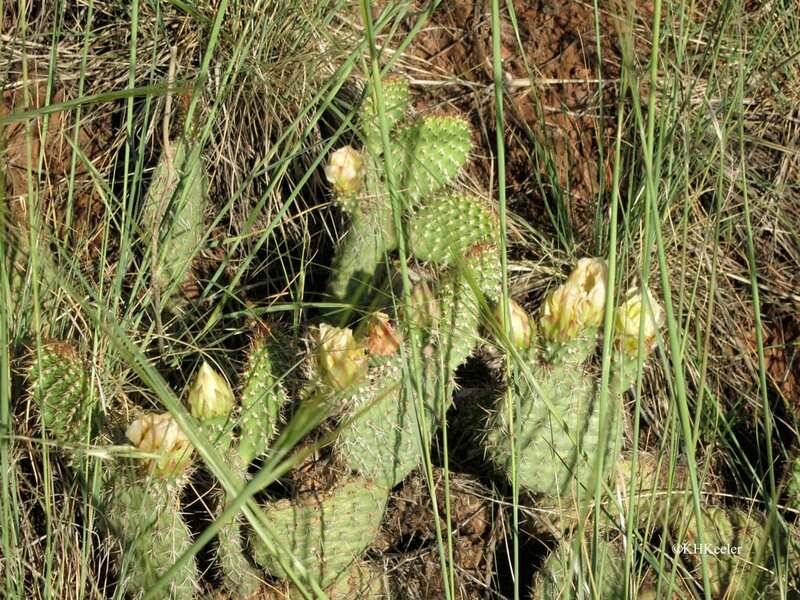 The third species is very much like the plains prickly pear but with only yellow flowers, pads that are often wrinkled and a fruit that is soft and “fruity” when ripe (Opuntia macrorhiza, twist-spine prickly pear). The plains prickly pear’s fruit is dry and withered when ripe. Pictures at USDA-Plants: http://plants.usda.gov/java/profile?symbol=OPUNT) Native. rubber rabbitbrush – Ericameria nauseosa. Asteraceae, sunflower family. The scientific name for this plant has recently been changed from Chrysothamnus nauseosus to Ericameria nauseosa, because it was determined to be distinctly different from all the Chrysothamnus species. It is the host of the northern checkerspot butterfly, Chlosyne palla. Pictures of butterfly http://www.butterfliesandmoths.org/species/Chlosyne-palla. Native. scarlet beeblossom – Gaura coccinea. Onagraceae, evening primrose family. One of many natives that little is known about about, it appears to open its flowers at night and so be pollinated by not just bees and butterflies but moths. Native. scarlet globemallow– Sphaeralcea coccinea. Malvaceae, cotton family. The long scientific name actually says “globe mallow” – sphaer for sphere (globe) and alcea is the name the Romans called mallows. Coccinea means “red.” It grows well on somewhat disturbed sites. There are 24 other species of globemallow in the United States, with flower colors from richer orange to very pale orange. This is the most widespread species in the genus. Native. skunkbush sumac – Rhus trilobata. (Anacardiaceae, cashew family). Once called squawbush, Native Americans used the fruits in teas. Fruits are small but rich in vitamin C. Native. 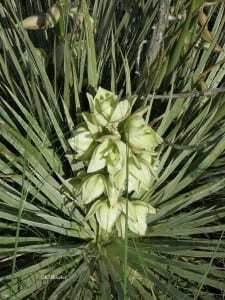 soapweed yucca – Yucca glauca. (Asparagaceae, asparagus family). The leaves are sharply pointed and fibrous–painful to bump into. Livestock avoid them. 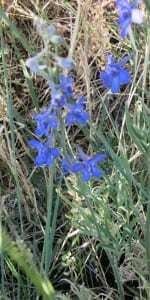 The flowers, however, are edible to animals and people–often deer, pronghorns and elk strip the flowers off. Yucca glauca (and other yuccas) are pollinated by a specific moth who lays her eggs in the flower while transferring pollen, so the yucca moth maintains yucca by pollinating and feeds on it. Seeds are usually in three columns within the seed pod and a moth will have eaten the centers out of every seed in one of the columns. The saponins in the root don’t make much lather, but they effective remove dirt. Native. wild rose – Rosa woodsii. Rosaceae, rose family. Also called wood’s rose, it is found across all of the western United States where the habitat is suitable. It likes dry grassy slopes and riverbanks. Rose fruits–rose hips–are small and pulpy but like other rose hips, edible and rich in vitamin C. Native.